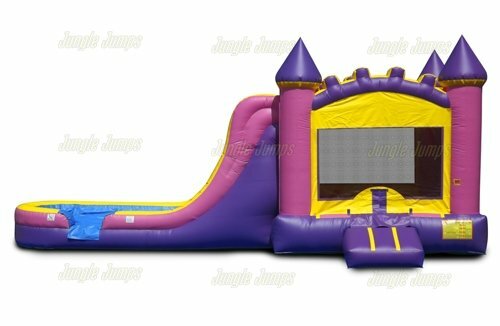 As one of our most popular inflatable combo products, this model offers fun for all ages. With a length of 28 feet, this pink themed inflatable combo features both a water slide and a bounce house. The slide is extra wide and ends in an attached oval splash pool. Riders arrive at the slide ramp from inside the bounce house, which has an arched roof for increased interior play room. Mesh windows on all sides allow for cooling ventilation.